Goalscorer-in-Chief: Russian President Vladimir Putin readies himself for the task ahead yesterday at Sochi’s Bolshoi Ice Palace. News that Vladimir Putin was skating and scoring on the ice yesterday wasn’t really news: the 62-year-old Russian president’s love of hockey is as well-known as his penchant for archaeology and for riding bare-chested on horses. He was at the Bolshoi Ice Palace taking part in a “gala” game dedicated to the 70th anniversary of the victorious end of the Great Patriotic (a.k.a. the Second World) War. Putin’s team was also Slava Fetisov’s, and they lined up with Pavel Bure, Alexander Yakushev, and Sergei Makarov as well. It will shock no-one to learn that they won by a score of 18-6, or that Putin scored eight of his team’s goals. The fact that Sergei Shoigu, Russia’s defence minister, added a hattrick — that, I own, caught me a little off my guard. Recognized as the game’s best player, Shoigu was rewarded with a trip to the Crimea. As a satire enthusiast, I wish I’d invented that last detail, but no, it’s true enough. I was checking in on Canada’s semi-final at the World Championships yesterday afternoon when I saw the Putin news. Feeling good about Canada’s team in Prague, I’d decided that they were strong and confident enough to do without me watching the whole broadcast of their game with the Czech Republic and that I — and they — we could get away with updates on my iPhone. And so it proved. Taylor Hall had just scored, on a pass from Sidney Crosby; Jason Spezza would add another goal to guarantee the 2-0 Canadian win. The Putin story was just filtering out by that time, along with news from the other semi-final where (also unaided by my viewership), Russia dismissed the U.S. by a score of 4-0. That’s when my eyes began to open to the bigger picture. Of course. 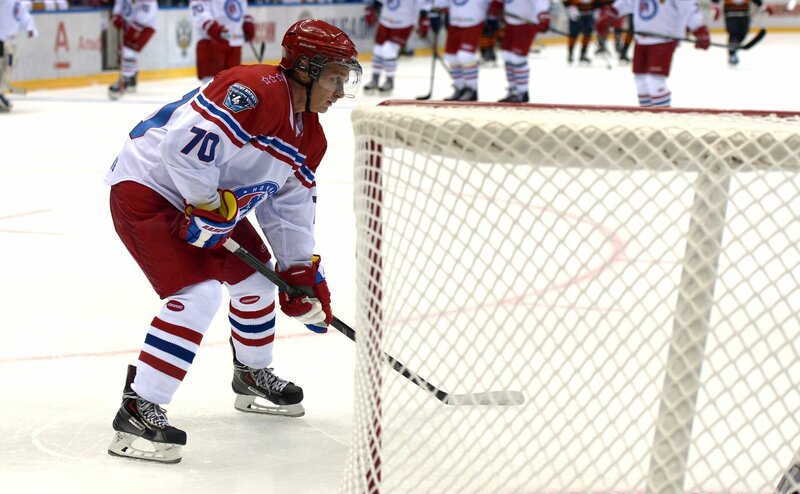 President Putin wasn’t just playing in a friendly game of pick-up by the Black Sea. He was, as Putin likes to do, sending a message. Sometimes they go out disguised as unmarked armoured columns headed west, towards Ukraine, while on other occasions they resemble air-force bombers skirting along the edges of foreign airspace. Mostly, messages Putin sends have a distinct sabre-rattling sound, but who says they can’t also clack like hockey sticks on ice? 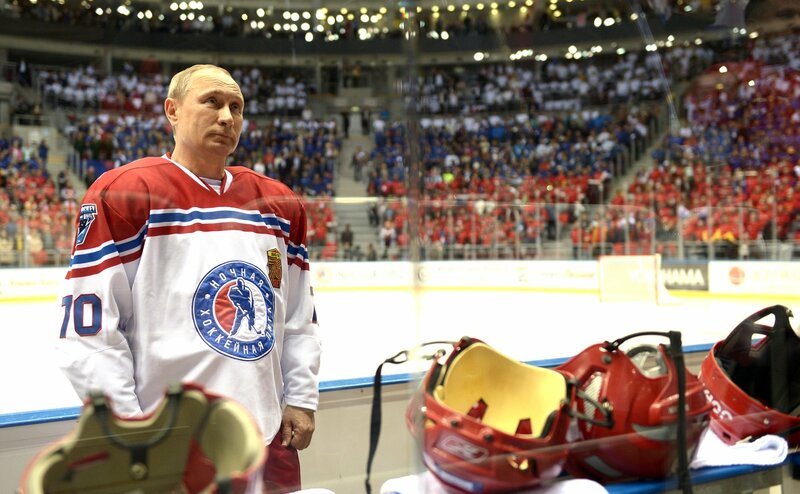 Anticipating that today’s Prague final would pit Russians against Canadians, Putin knew what he was doing. The fans in Sochi may have enjoyed Putin’s goals, his preening, but they weren’t the intended recipients. Even as he entertained them, he was trolling us, Canadians, marking his territory, telling those of us who hold the maple leaf high that when it comes to ice, that’s Russian territory, as it ever was, just like with Crimea and Novorossiya. I don’t know why we haven’t responded. That’s what puzzling. When I say we, I mean, of course, Prime Minister Stephen Harper. Diplomacy dictates that if Canada wanted to answer a display like Putin’s, it would have to come from the PMO. Is it possible that they missed it? That Putin sent his message and it wasn’t received? I don’t know how else you could explain Ottawa’s silence. Are you telling me that the PMO couldn’t at short notice have organized a game at Ottawa’s Canadian Tire Centre to answer to President Putin? Maybe last night would have been pushing it, but what about this morning? The Conservative Party is always dialling up instant crowds of hard-working Canadians to backdrop the PM as he pretends he’s not already electioneering, so how hard would it have been to this morning? As for players to skate, well, what’s the Cabinet for other than to lace ’em up whenever the boss calls, needs interference run, a screen in front of the opposition’s net/pertinent inquiry during Question Period. And it’s not as if actual hockey players are in short supply around the capital — Ottawa not only has a whole NHL team of players with nothing to do, they’re called the Senators, after our national chamber of sober second-thinkers (mostly) beholden to the man who appointed them. It would have been easy to outdo Putin at his own game — that is, at our game. Harper could have taken to net, maybe even played both ends, skated away with a pair of shut-outs, awarding himself a trip to Kurdistan. That would have shown the Russians. I’m not saying our lack of leaderly showing-off is going to make any difference in today’s final in Prague: what happens there is up to the Crosbys and Eberles and Ovechkins and Malkins. All I’m saying is, I don’t know — either our PM isn’t the prince of propaganda I took him for or else he was genuinely impressed by Putin’s feat of never scoring fewer than two hattricks in any game he’s ever played. I guess that could explain why Stephen Harper held himself goalless this weekend.